We know leaving your child in the hands of others could be difficult if you’re not completely comfortable with the situation. As a result, our experienced care givers (most of whom have been with us since we opened in 1994) strive to put you at ease and to make your child feel “at home”. This nurturing and consistent environment is accomplished by following a few basic guidelines. First of all, each infant has a daily schedule for feeding and napping based on his/her needs and parent instructions. We do not force a formal group schedule on the infants. Part of this schedule includes up close personal time holding, rocking and talking to your child. We believe this contact is necessary and helps to encourage trust and affection. 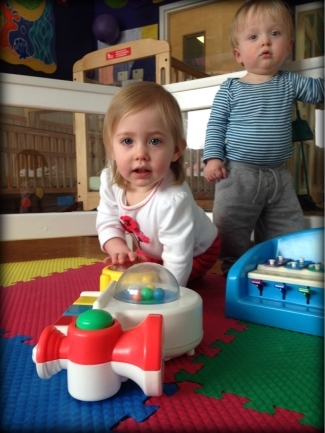 In addition to meeting their daily scheduling needs, we provide activities to teach infants about their surroundings. Our approach is more tactile because we are always holding, hugging and interacting with the infants. Verbal stimulation is also accomplished by singing, talking, and listening to music. We believe this approach provides a great foundation for child development. We enhance this approach with a soft-scape play area that allows your little one to safely explore the world of sights, sounds and textures while developing early motor skills, hand-eye coordination, visual tracking skills, and handling skills. Education and care giving are inseparable components of any child's day at The Enrichment Center. Very briefly, there are items that we provide and others that are provided by the Parent. For instance, at the appropriate age we will provide a wide selection of jarred baby foods, cereals, fruit juice, whole milk and table foods. This allows you to pick foods that are best suited for your child’s tastes and expectations. We also provide supplies like wipes, blankets, comforters, and sheets. We do ask that you provide formula and/or breast milk, diapers, three changes of clothing, and two bibs. These articles will be used in the room and laundered by the staff on a daily basis. The Enrichment Center is a very clean facility. We take every antiseptic measure to help maintain a germ-free environment. This is, in part, accomplished by filtering the room’s air with a hepa-filter, disinfecting every surface that may come in contact with your baby and using gloves for every diapering and/or administration of ointments. Please stop by and observe the infant room so you can meet our teachers and see how we operate first-hand.